The individual section maps are overviews of the approximately 120 miles of the Paul Bunyan Trail. You may read each individual description to find the right area you are searching for and then click the “View Map” text to see that segment. You may also click each town on the section maps to see a description of that town and a detailed city map. Paving of the Paul Bunyan Trail is almost complete! Currently, 120 miles of the trail are paved. 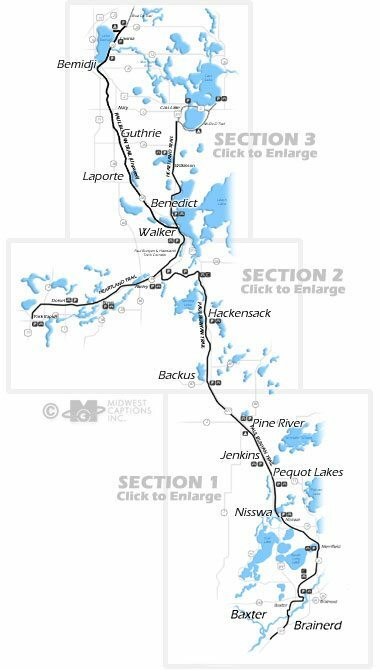 The 12 miles from Bemidji south to Guthrie was completed in the Spring of 2009. Paving continued in the Spring of 2010 on the stretch of trail from Guthrie south to Walker–yielding a continuously paved trail from Brainerd/Baxter north to Bemidji State Park! The bridge over Bemidji Ave. in Bemidji is now completed to offer safe passage over the 6 lanes of traffic that the trail previously intersected. The segment of the trail from Baxter south to Crow Wing State Park, was completed in July 2014. All 47 miles of the Heartland State Trail is also paved.